The Coupling Hole Alignment Tool (CHAT) is a further development from the Pilgrim product portfolio. 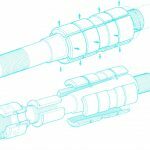 Designed in response to OEM maintenance and end user requirements, the CHAT hydraulically expanding tool saves time and reduce costs during the alignment and closure of shaft couplings. 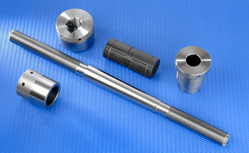 Depending upon coupling size, each CHAT package consists of 3 or sometimes 4 tool assemblies. The tools are inserted into equi-spaced flange holes and are simultaneously pressurised to align the coupling holes. The coupling faces are then closed using the tools in preparation for installation of the coupling bolts. The CHAT system is powerful and safe, highly effective, versatile and easy to handle. It can greatly improve the accuracy and effectiveness of outage planning. Should conventional coupling bolts be seized because of coupling slippage, the CHAT can be used to adjust and hold coupling alignment as bolt removal is achieved. Interchangeable Sleeves to accommodate hole size variations.